Methyl salicylate is a natural ester that performs very similarly to menthol. It is commonly extracted through steam distillation of wintergreen leaves. According to WebMD, methyl salicylate is found in many topical ointments bought over the counter for minor joint aches or muscular pains. It can also be found in intimate products. Most of these products should not be used on younger children because of toxicity concerns, which we’ll talk about later in this article. Methyl salicylate smells very strongly of mint. In spite of this, it should also be noted that this compound does not belong in the mint genus of plant species. The burning cold sensation is activated through the TRPA1 channel. Methyl salicylate also activates the heat channel TRPV1, which is the same channel known to be activated by hot peppers like capsaicin. Sometimes, wintergreen oil is used in conjunction with peppermint oil, since the two in tandem are believed to attenuate beneficial effects. Wintergreen oil is obtained by steam distillation of the warmed, water-macerated leaves. It is sometimes used interchangeably with sweet birch oil for flavoring foods and candies. One study published in the Annals of Pharmacotherapy aimed to analyze the efficacy of methyl salicylate in platelet inhibition in comparison with aspirin. Platelet aggregation is another way of referring to platelets clumping together in the blood. This is related to blood clotting. There was no large difference between the two. This suggests that methyl salicylate works as effectively as aspirin for platelet aggregation, at least in healthy individuals. Investigation of this substance on the internet will reveal a handful of case reports of infant death. A few things should be noted about these. Such infant deaths often involved the accidental swallowing of pure oil of wintergreen, the highest concentration of methyl salicylate you can get. This is why oil of wintergreen is considered to be relatively low-risk with few side effects. However, it is recommended that new parents avoid having the substance in the house, on the off-chance that an infant could get his or her hands on it. Also, it is worth noting that methyl salicylate has been restricted for use in cosmetics in Canada. Among many nutritional benefits of hemp seed oil constituents, you can also find trace amounts of methyl salicylate. Hemp seed oil’s fatty acid content (omega-3s and omega-6s) is most notable as a nutritional plus. The oil also contains 10-15% fiber, 20-25% protein, and 20-30% carbohydrates. A bioassay published in “The Composition of Hemp Seed Oil and Its Potential as an Important Source of Nutrition” reported on the methyl salicylate content of hemp seed oil. They also reported on the other things present in hemp seed oil, such as cannabidiol, ?-Sitosterol, tocopherols, and terpenes and terpenoids. Methyl salicylate is a natural ester that can be made organically or synthetically in the lab but is usually extracted via steam distillation of wintergreen leaves. Oil of wintergreen is the strongest, purest concentration of methyl salicylate. DO NOT INGEST oil of wintergreen. Methyl salicylate is also found in over-the-counter products such as toothache creams and muscle pain relievers to relieve pain and cause a soothing sensation. It is also sometimes used in small amounts to flavor foods and candies. Wintergreen oil applied to the skin in the right doses can represent the same amount of salicylate present in one 325 mg aspirin tablet. Methyl salicylate works effectively against platelet aggregation—about as much as aspirin does. Methyl salicylate is found in hemp seed oil in trace amounts. We hope this gives you further insight into just how complex and versatile the cannabis plant is in its constituents and compounds. Visit our blog to learn more about cannabinoids, CBD, anxiety, or news topics about dispensaries. 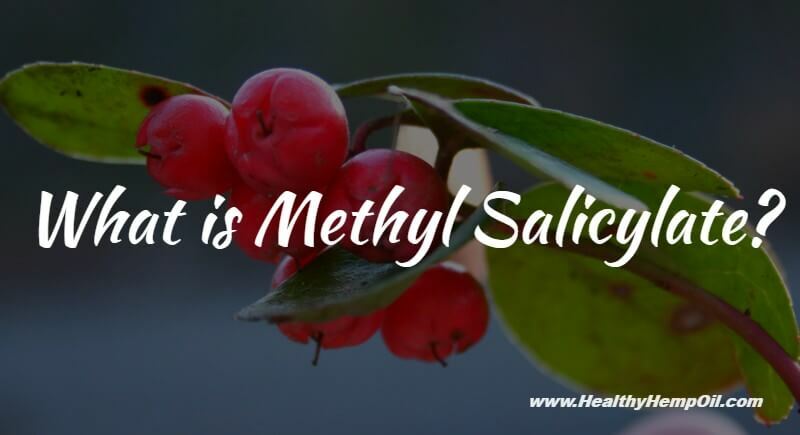 Have you used methyl salicylate before without recognizing what it was? Let us know down in the comments below. And feel free to ask any questions about CBD products.